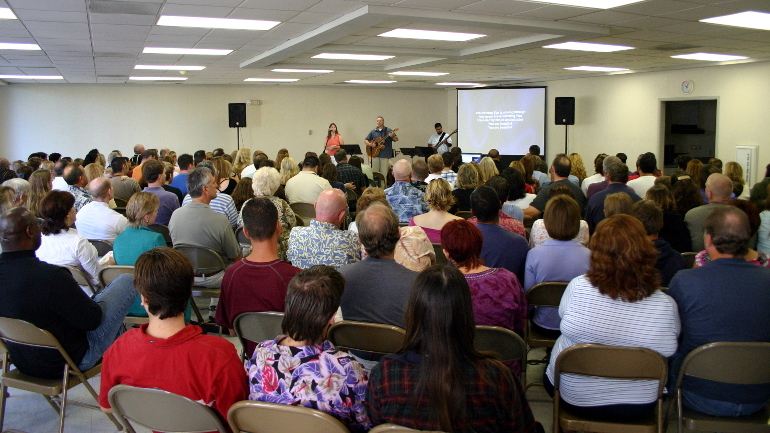 As part of celebrating Touchstone Christian Fellowship’s ten-year anniversary, I am re-posting a few of the original blog entries from those first days of the church. This first one is a guest post that was written by Patty Hawkins as a Valentine to the church, just four months after Touchstone started. It is a beautiful description of those early days of the church when we were meeting in the community center at Hamilton Street Park. I’m sure it will bring back some sweet memories for those who were there. I know it did for me. I love that there are men looking out for our stereos and willing to stand out in the cold while I relish in the teaching and worship. I love that Julie runs over to make sure I have a bulletin because I didn’t come in the right door. I love that someone is crafty and thoughtful enough to decorate the back tables. I love to look over and see Rylie smile at her best bud in the row in back of her. I love whoever was singing behind me last Sunday night because it was an awesome praise to the Lord. I love it that Shane leaves his Bible behind and his brothers just have to take the time to razz him about it. I love that Jodie places each individual chair at an angle so the “sitter” will get the best view of the pastor as possible. I love the banners that hang in the front that some wonderful graphic person created to reflect the heart of Jesus. I love that someone meticulously places all the sound cables to the side in thought of avoiding the tripping of others. I love that there are prayer team members daily committing time to ask God to work a wonder in the lives of people they don’t even know. I love that Betty carefully organizes… everything. I love that Mary always smiles when she is singing… as a matter of fact, I love it that Mary always smiles, even when her back was hurting. I love to hear the children screaming out in joy from the Sunday school room. I love that someone has taken the time to plan crafts, prepped for crafts, and assembled crafts for those screaming children… those crafty people always impress me. I love that someone loves children of all ages and will open their house up for large groups of teenagers. I love that the worship team is a high-end-quality-God-glorifyin’-praisin’ ensemble. I love that Joey lifts his hand in praise and keeps one hand on the mouse to flip the song lyrics on the screen. I love it that we have talented sound people who record the teachings so I can listen at my leisure should I miss a service. I love it that someone takes the time to make coffee and bring half and half. I love that Gary has one cool collection of guitars, and the most welcoming nature. I love it that Sharon, Shannon, and Sylvia can multi-task at the back of the service… singing and assembling Sunday school projects. Now that is good time stewardship! I love the bustle of everyone helping put the chairs away at the end of the night. I love it that I only know about 30 members of my family because that means I still get to meet at least 170 more… now that’s goin’ be a whole lotta more love to talk about. Blessings and love to my new family.